The bows are stunning and great for party wear; the simple black on noir motifs are for all day attire….and inspiration for you ..few changes can be made to modify to your needs also. Great selection of new trims to start our New year campaign of trimmings and accessories for neotrims uk/ china. 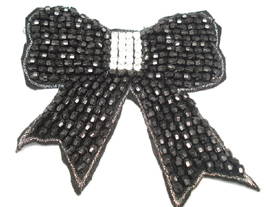 Hand embroidery Bow on Black base, Black facetted beads all over and centre with clear crystals. Lavish! Pin can be attached at back. Stunning Silver beads and Clear Rhinestones border; a Double bow, shimmering with silver, on black base. 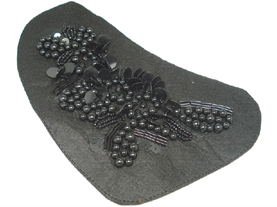 Pin can be attached at back Hand embroidery motif patch, black on black with various beads and pearl beads; great for embellishment on any attire. 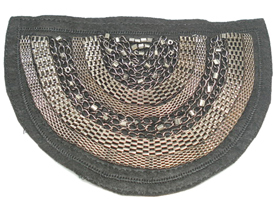 Elaborate embellishment for Garment or Bag, Rhinestones, beads and Chains; hand embroidery. Great as centre panel Semi circle embellished all chains motif in gunmetal and black. Also has rhinestone details edge. 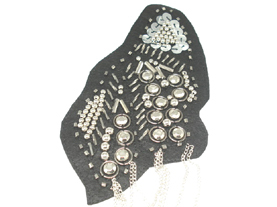 Facetted dome metal beads, bugles, sequins.....a all silver affair with hanging chain on black felt patch. Pin can be attached at back.